Hello, dear readers. It’s time to talk supplements! Before we get started on the specifics of what I take and why, I want to be clear that I am not making recommendations here. I am simply sharing what I do, why, and how I have found it to be beneficial. Your mileage may vary depending on where you are and what your goals are. Your supplementation should be specific to your needs. I also want to be clear that there is no magic pill or potion that will do for you what eating *SANE foods and doing eccentric exercise will when it comes to reducing body fat. I don’t take any of these supplements to help me lose weight, although it is true that when our bodies are working optimally they will naturally burn body fat instead of storing it. As always, you would be wise to consult a Dr. before starting any supplementation, especially if you are taking any medications. If you are new to supplementation you may find, like I do, that you have to take them with food. If I take them on an empty stomach I can pretty much guarantee that they’ll be coming straight back up again. These are the supplements that I take daily. If you’re going to supplement you need to be consistent. Taking them here and there will not help you, so do whatever you have to do to make taking them routine. Set them out the night before, use one of these so you know whether you’ve taken them or not, keep them somewhere visible in the kitchen so you always see them, have a reminder posted on the ‘fridge door, set an alarm, or you know I am sure there’s a app for that. To save time in the morning, every couple of weeks (but you can do whatever frequency works best for you) I get a pile of small Ziploc baggies and put a days-worth of supplements in each one. This means I can just grab a baggie and go without having to take the time to undo a multitude of bottles every day. Yes I could get up 5 minutes earlier to make sure I have time to take supplements, but a) I value my sleep more, b) it gives me one less thing to do as I start my day, and c) I never miss taking them. Winning! This is my make-sure-all-the-bases-are-covered supplement. While eating lots of veggies means that in theory you are getting enough of everything, the amounts of nutrients vary according to many factors, not least of which is how long they have been harvested. You don’t know exactly when your romaine lettuce was plucked, and the nutritional value falls the longer ago that was. We have no absolute way of telling exactly what we’re getting. Plus, who has time to keep track of everything you eat in order to calculate whether you’re getting enough selenium or vitamin K in your meals? Not me. Even if you had the time, it would probably drive you crazy. The multi-vitamin / mineral is my buffer for getting a basic daily amount of everything. I get my multi from Melaleuca, which unless you’re already a customer – or know someone who is – it’s a pain to get them. I recommend doing your own research to find a high-quality (there’s lots of rubbish out there!) multi. I am big fan of Now Foods supplements so that could be a good place to start. I am deficient in vitamin D. It seems like everyone I know here in Seattle takes a vitamin D supplement to top up what we get in the way of natural sunshine. The other reason I take it though is because research shows that vitamin D may play an important role in mental health and in depression. We don’t know if being deficient in vitamin D causes depression or whether depression causes a deficiency in vitamin D, but either way, I am going to take steps to get my levels up. I use Now Foods Vitamin D.
This is the supplement that my Naturopath recommended to get my adrenal glands healed and back on track. You can read about my long-suffering adrenals here. I have found this supplement enormously beneficial, particularly in getting my brain jump-started in the mornings and giving me more energy. I use Vital Nutrients Adrenal Support. This is an amino acid that Jonathan recommended I try to help with the constant fatigue and loss of mental focus that I was experiencing at the start of the year. L-Glutamine is a major fuel and energy source for the body and brain. Research has shown L-Glutamine to improve brain functioning, promote alertness, focus, memory, problem solving, and overall intellectual functioning. L-Glutamine has a high priority in brain health. It also supports protein synthesis, builds muscle and stores glycogen for energy in the muscle tissue. L-Glutamine has also been shown to decrease addiction cravings and I have definitely noticed a decrease in my food cravings since I’ve been taking it. Hurrah! I use Now Foods L-Glutamine. This is another recommendation from Jonathan to help me in the energy department. Reported benefits include reduction in fatigue, increase in energy and stamina, greater gains in lean muscle from workouts, a reduction or prevention of muscle loss due to aging, and reduction or prevention of muscle soreness. Each tablet also provides 2g of protein. I have gone from being too exhausted to exercise to being able to increase resistance at the gym every week since I’ve been taking these. I use Beverly International Ultra 40. I have had psoriasis (some Drs. say eczema) since I was 11, so when I read that turmeric is an incredible anti-inflammatory I had to try it; slowly but surely my psoriasis is improving. Turmeric has been credited with a whole host of other beneficial properties – a great antioxidant being one of them – but it has also long been used in Chinese medicine for treating depression, so it’s no surprise I was all over it. I use Now Foods Curcumin. I have been using niacin for several years to help with depression. It has also been found to lower total cholesterol and relieve joint pain. I have enjoyed all 3 benefits since taking it. If you are considering taking niacin I strongly recommend you read this post to determine how much you need, which kind to get and how to take it – the tips and tricks are towards the bottom (it’s a long post). I use Now Foods Niacin. 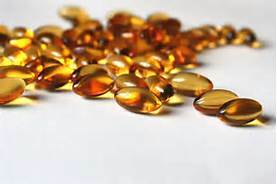 A quick search on the web will bring you countless benefits of supplementing with omega-3. I do it for 3 reasons – it’s anti-inflammatory benefits, for joint health, and because there is evidence that omega-3 may be useful for depression and bi-polar disorder. I use Now Foods Ultra Omega-3. Rose - Carrie, did your Naturopath help you with the adrendal dosing or did you follow the dosing info on the bottle and take them along with your other supplements? I use Nutri-Meds Whole Adrenal (bovine based). So far I’m at 80 mg in the morning along with my morning W.P. Thyroid 65mg. I’m still tweaking my adrenal dosing. I continue to tweak the dosing. In a few weeks I may cut the 80mg in half and take every 12 hours, then a few weeks later try 80mg in the morning/night. I truly believe that many, MANY people who struggle with weight and/or depression have uncontrolled thyroid+adrenal issues. I’m thankful Carrie and I have access to great Naturopaths. For folks who don’t have these resources in your city/county, keep in mind many practitioners will speak with you via Skype and send you the tests along with the lab’s shipping labels. Just call or email the Naturopath and ask! !